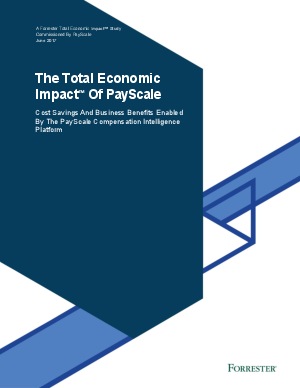 To help businesses realize the full impact of better compensation management and communication, PayScale commissioned Forrester Consulting, an independent research firm, to conduct a study evaluating the total economic impact of PayScale. Their analysis is clear, stronger data and better communication around pay, pays for itself and then some. 90% reduction in survey management time: PayScale automates the survey management process to free up time for strategic projects. 3% reduction in turnover: Forrester calculated $2.1M savings related to reduced turnover and lower recruiting costs. 249% ROI: PayScale solutions save millions with an ROI of 249%!